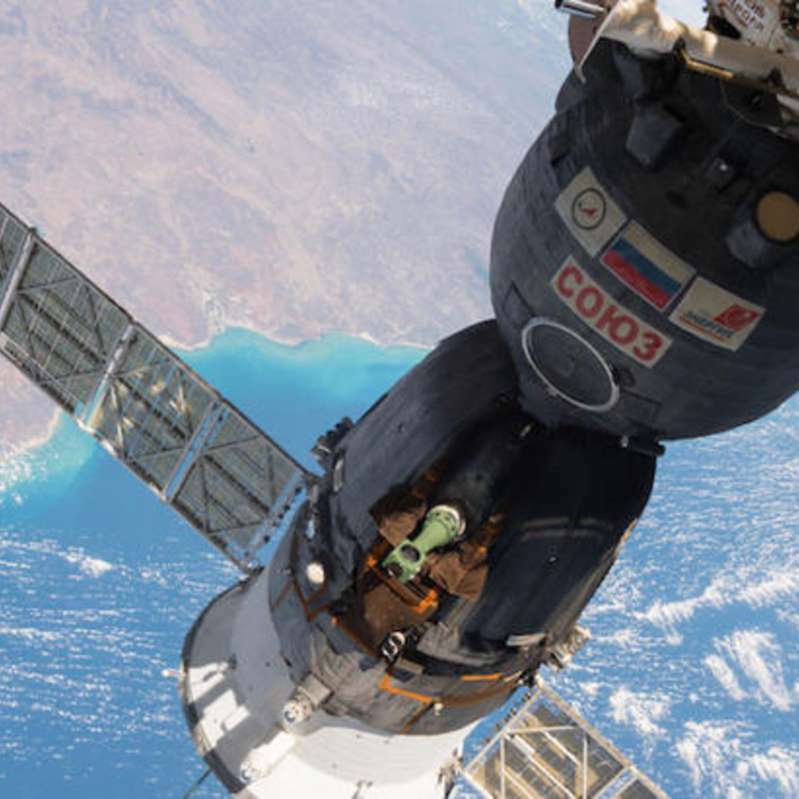 Ruling out a strike by space debris or a micrometeoroid, Russian engineers say a small leak in a Soyuz crew ferry ship docked to the International Space Station was the result of a hole drilled into the wall of the spacecraft's upper compartment, an apparent case of human error. The hole was discovered and patched last week. According to Russian media accounts, Dmitry Rogozin, director general of the Russian space agency Roscosmos, told reporters Monday the hole was drilled "by a human hand" and that he was not ruling out any theories, saying it could have happened on the ground before launch or after the spacecraft reached orbit June 6. Known for controversial comments and tweets, Rogozin — a former deputy prime minister who was sanctioned by the Obama administration in the wake of Russia's 2014 annexation of Crimea — did not address why an astronaut or cosmonaut might do such a thing given the obvious danger to the space station and its six-member crew. "We are considering all the theories," Rogozin said Monday in a report posted in English by the TASS news agency. "The one about a meteorite impact has been rejected because the spaceship's hull was evidently impacted from inside." While he said it was too early to come to a conclusion, "it seems to be done by a faltering hand." "It was done by a human hand, there are traces of a drill sliding along the surface," he said. "We don't reject any theories." He said "it is a matter of honor for Energy Rocket and Space Corporation (Soyuz builder RSC Energia) to find the one responsible for that, to find out whether it was an accidental defect or a deliberate spoilage, and where it was done – either on Earth or in space." Sputnik International, another Russian news site, reported RSC Energia is carrying out detailed inspections of all Soyuz and Progress supply ships now being prepared for launch to look for any similar problems. Because the issue involves a Russian spacecraft, NASA had no immediate comment. An official at agency headquarters in Washington referred questions to Roscosmos. The leak was discovered last Wednesday evening when sensors aboard the space station detected a slow loss of cabin air pressure. It was not deemed serious enough to wake the crew, but the next morning the four astronauts and two cosmonauts making up Expedition 56 traced the leak to the upper module of the Soyuz MS-09 spacecraft docked to the Russian Rassvet module. The spacecraft rocketed into orbit on June 6, carrying cosmonaut Sergey Prokopyev, European Space Agency astronaut Alexander Gerst and NASA flight engineer Serena Auñón-Chancellor to the space station. Photographs of the hole in the Soyuz's upper habitation module that were downlinked by the station crew showed what appeared to be a drilled-out penetration in an interior panel with several nearby gouges like those that would be caused by a drill skipping across a surface before digging in. Prokopyev and fellow cosmonaut Oleg Artemyev, acting on instructions from the Russian mission control center, plugged the hole with gauze soaked in epoxy. The plug held, and flight controllers boosted cabin air pressure back to normal levels. The crew was never in any danger, officials said, and a safe re-entry by the Soyuz MS-09 spacecraft was never in question. The upper module can be sealed off and in any case, it is jettisoned prior to atmospheric entry. Initial Russian media accounts speculated a technician mistakenly drilled the hole during pre-flight processing and then attempted to cover up the mistake. RIA Novosti quoted a source at Energia saying "the hole was made on the ground. The person responsible for the act of negligence has been identified." Another source told the news agency the worker did not report the error and instead applied a sealant of some sort. After two months in orbit, the sealant apparently dried out, the source said, and was expelled by the cabin air pressure, opening up a leak.